What do U.S. ELA teachers know and report doing in the classroom in regard to selection of complex, grade-level texts? What do these teachers know and report doing in the classroom for close reading of complex, grade-level texts? What is the relationship between teachers' self-reported reading instructional approaches and their understanding of two ideas aligned with most state reading standards: use of complex texts and close reading of texts? In a 2016 report, RAND researchers explored English language arts (ELA) teachers' implementation of their state standards, with a specific focus on three key aspects: teachers' instructional materials, their knowledge about their standards, and their instructional practices. This report provides an update based on data from a spring 2016 survey of the RAND American Teacher Panel (ATP). In particular, the authors connect teachers' approaches to reading instruction with their understanding of two ideas aligned with most state standards related to reading: use of complex texts and close reading of texts. 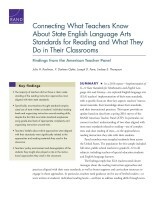 The findings imply that ELA teachers need clearer messages about the reading instruction approaches and practices aligned with their state standards, as well as better supports and curriculum resources to engage in those approaches. In particular, teachers need guidance on the use of leveled readers — or texts written at students' individual reading levels — and how to address reading skills through texts. Specifically, most teachers thought standards emphasized use of texts written at students' individual reading levels and organizing instruction around reading skills, despite the fact that most state standards emphasize using grade-level texts of appropriate complexity and organizing instruction around texts. Teachers' beliefs about which approaches were aligned with their standards were significantly related to the approaches and reading materials they used in the classroom. Teachers' policy environment and demographics of the students they taught also played a role in the instructional approaches they used. ELA teachers need clearer messages from their state, district, and school about the reading instruction approaches and practices aligned with their state standards, as well as better supports and curriculum resources to engage in those approaches. In particular, teachers need guidance on the use of leveled readers — or texts written at students' individual reading levels — and how to address reading skills through texts. 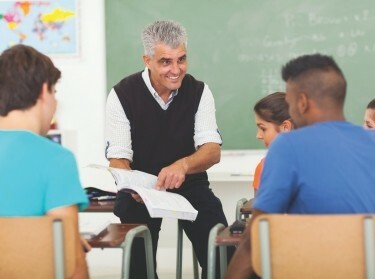 States and districts should strive to provide teachers with a range of supports and tools to help them engage all students in working with complex, grade-level texts. Those who support teachers should specifically ensure that teachers are not teaching reading skills in isolation from texts. V. Darleen Opfer @VDarleenOpfer, Julia H. Kaufman @juliahkaufman, et al. The research described in this report was funded by the Leona M. and Harry B. Helmsley Charitable Trust and conducted by RAND Education. Kaufman, Julia H., V. Darleen Opfer, Lindsey E. Thompson, and Joseph D. Pane, Connecting What Teachers Know About State English Language Arts Standards for Reading and What They Do in Their Classrooms: Findings from the American Teacher Panel. Santa Monica, CA: RAND Corporation, 2018. https://www.rand.org/pubs/research_reports/RR2258.html.